Teenage heartbreak, as we know, is rather all consuming. What is even more all consuming for Romeo, however, is his being attracted to literally anyone who is passably good looking. That’s right – today I’m looking in to Romeo and Juliet’s first meeting. Romeo and Juliet’s first meeting is laced with the language of love and honour. 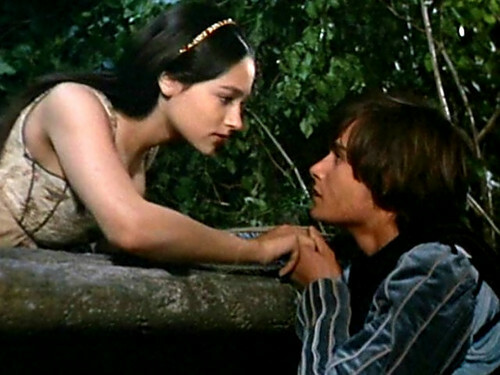 Their first fourteen lines’ conversation makes a sonnet, which ends in their first kiss; Romeo uses the metaphor of religion and pilgrimage to show how his love for Juliet is honourable, rather than sinful lust. Romeo here fulfils his role as lover – he is flirting, playing, persuading Juliet to like him in return. He likens her to a “holy shrine”, his lips to “two blushing pilgrims”. Because the only way he can present his lust as love is to phrase it in the language of religion. Religion is honourable; lust is not. It is worth noting here that Romeo, before he speaks with Juliet, speaks of love only in terms of physical attraction (which dovetails with his role as a Petrarchan lover). When he speaks of Rosaline, he talks about how she has “sworn to live chaste”. And it is through this that we can sympathise with those who disbelieve Romeo’s love. After all, “it is characteristic of this love learnt by rote from sonnet writers that Romeo should combine images and puns which suggest this slave-like devotion to his mistress with others that imply a masterful attack on her chastity” (Mahood, Shakespeare’s Tragedies, ed. Lerner, 1970). So it may be all well and good that he is offering his faith and love and obedience, but really he just want to hook up with a pretty and unattainable girl. 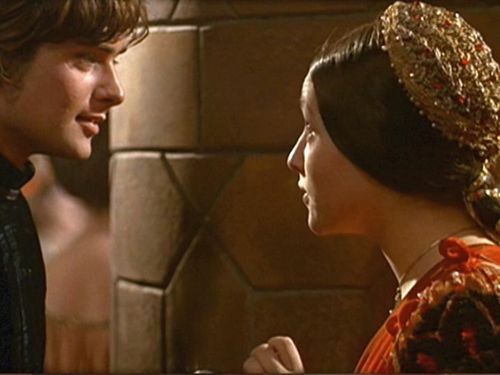 So when he speaks to Juliet for the first time, and he speaks of religion, of faith, and of worship, it doesn’t seem unreasonable to be cynical. Romeo obeys the conventions of flattery and courtly love here which would be aspirational for the time, but what underlies that courtly language? After all, one can imagine that he also held Rosaline up as a “holy shrine”, and then was miserable because she wouldn’t sleep with him. (see last week’s post on heartbreak for more chastity-comment-induced eyerolling). So is it even a surprise that Juliet responds hesitantly, rather than throwing herself at him? It would be unfair, as some may argue, to say she is being teasing here; she has just been addressed by a perfect stranger, so it seems only fair to expect her to not throw herself at Romeo’s feet. Especially when someone growing up in the world Juliet has will be more than versed in the language of courtly love. Romeo asks “have not saints lips, and holy palmers too?” and Juliet reminds him “ay, pilgrim, lips that they must use in prayer”. She is not falling for his religious flirtation as easily as he might think. The balcony scene is a display of Romeo’s passion, of his flowering language, and of Juliet’s solitary confession of her feelings. Which Romeo overhears. Not very gentlemanly, Romeo. She is making it clear to him that if he wants to be with her he’s going to do it properly – marriage, commitment, and do the whole thing honourably. Romeo is a character of passion; Juliet, in comparison, is a character of relative sense. The only lack of sense we could argue is the fact that they are getting married so quickly – but then again, would it be so very tragic if it happened over weeks, not days? So Romeo may not necessarily be feeling true love. True passion, certainly. And Juliet may not be feeling true love – but she is feeling first love, and is acting on it in the way she knows can best secure her own safety. Not that getting married ended so well for the pair, but still… That’s what I love about tragedy!